Private sector engagement on sustainable supply chains and reducing deforestation was in ample supply in 2016 as the world started to mobilize behind the Paris Climate Agreement. However, greenwashing and unfulfilled corporate pledges remain valid concerns as the 2020 deadline for many companies looms ever closer, and much remains to be done. 31 December 2016 | Market research firms are reporting strong holiday-season sales for 2016, numbers not seen since the mid-2000s, as lower gas and food prices, a rising stock market and higher wages propelled shoppers into stores and onto retail websites. And while consumerism typically has a negative effect on the world’s forests – everything, it seems, comes from the rainforest – it isn’t necessarily true this year, or at least there is reason to be optimistic. Earlier this month, Ecosystem Marketplace scouted the holiday shopping landscape for its eco-friendliness discovering some promising gift ideas – Gucci’s retro handbag is made with deforestation-free leather – and finding supply change disclosure and transparency efforts from CDP, Canopy and Forest Trends’ Supply Change project make it markedly easier to determine a product’s environmental impact, though it’s still difficult. Mark Trexler, the longtime expert on environmental policy who now runs the Climatographers, wrote this year that the private sector is massive and diverse and sees the climate problem in different ways. However, investors and the business community as a whole are increasingly becoming more involved in climate action that involves sustainable supply chains and forests, a global movement that began in earnest in 2014 with the New York Declaration on Forests. Supply Change, tracking corporate commitments through publicly disclosed data on the “Big Four” forest-risk commodities: palm oil, cattle, soy and wood, identified a rise in corporate commitments to end deforestation this year. The report, Tracking Corporate Commitments to Deforestation-free Supply Chains, 2016, tracked pledges up from 307 commitments and 243 commitments in March of 2015 to 579 pledges and 366 companies. And since nations signed the Paris Climate Agreement on Earth Day 2016, 41 corporates joined the Science Based Targets initiative setting rigorous climate targets that align with the Paris Agreement. In total, over 150 businesses have joined. But while companies are making progress on greening their supply chains, all is far from well. It’s an incredibly difficult process and companies quickly learned in 2016 that setting a deforestation or sustainability commitment is far different than achieving it. The cattle sector, for instance, is particularly difficult to track because of their mobility. 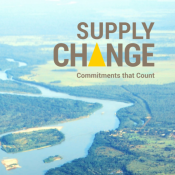 Many companies are turning to certification programs at least to get started as 77% of commitments tracked by Supply Change rely in some way on third-party commodity certifications such as the Forest Stewardship Council or the Roundtable for Sustainable Palm Oil. The Forest Trust, however, is one organization interested in helping companies turn their commitments into action in ways that don’t involve certification programs. Only half of the companies that pledged to source certified soy have yet to integrate it into their supply chains, although 74% of the companies that committed to sustainable palm oil have done so, according to a CDP report released in March. NGOs such as Climate Focus say companies need more help, and during the November climate talks, the Global Canopy Programme (GCP) and Stockholm Environment Institute launched a platform called Trase, (Transparency for Sustainable Economies), which makes it possible to track soybeans from specific municipalities in Brazil, through traders, to end countries. Such supply chain transparency will not only benefit businesses but also the watchdogs tracking companies’ progress on commitments they have set. During the climate talks, Climate Focus released a progress report on the NYDF, which focused on the second of its 10 goals: “Support and help meet the private-sector goal of eliminating deforestation from the production of agricultural commodities.” The assessment couldn’t produce results on parts of the goal because there is currently no available data to determine whether corporate commitments to reduce deforestation are translating into real reductions. Companies continued to establish targets this year and last to improve sourcing of commodities driving deforestation, many of them setting their target date at 2020, the same year other companies who started working toward that goal much earlier. The corporate newcomers are aiming to achieve in a shortened timeline what the early movers are taking a decade to do. In September, Ecosystem Marketplace explored the action required for companies to achieve their targets. Disclosure is another issue. There is a high-progress/low disclosure paradox found in the company profiles Supply Change tracks. Of the commitments that have progress information publicly available, the average achievement rate was 72% as of November 2, 2016. However, only 48% of the commitments were disclosing progress information. Do companies only disclose progress when it is good news? How can companies be held accountable for these commitments? And, since the progress information is almost always self-reported, can the numbers be trusted? We’ll know more when Supply Change releases its new report in March of 2017 but we can expect to see these questions often throughout the coming year. Brazil’s Soy Moratorium has been a successful tool in lowering deforestation attributed to soy in the Amazon, and in May, industry associations administering the moratorium decided to renew it. Also in Brazil, municipalities launched efforts to lower their high rates of deforestation, and in February, Ecosystem Marketplace explored the birth of the country’s first “Green Municipality,” sprawling Paragominas in the state of Pará. The efforts could pay off as consumer giants such as Unilever and Marks & Spencer have made announcements to source raw materials from environmentally conscious regions. Paragominas’ efforts have yielded mixed results and significant insights into what it takes to slow deforestation in the Amazon. Meanwhile, Kenyan dairy farmers are leveraging trees to boost their milk yields through an agroforestry project. They’re receiving funds from food companies Danone and Mars, both of which are interested in using sustainable agriculture to build sustainable supply chains. Sustainable agriculture is critical to solving the climate challenge as food production is a major driver of global warming, contributing about a quarter of the world’s greenhouse gas emissions, and stands to be among the sectors most affected by climate disruptions. Speaking of food, America’s love affair with the avocado came to a head in 2016 as revelations revealed farmers are chopping forests in central Mexico in order to grow more of the famously healthy commodity. Ecosystem Marketplace explored the problem in detail in August as well as solutions, which aren’t coming in a neat tidy box. It can be a vicious cycle as regions clear forests to grow more food but deforestation disrupts ecosystem services and often undermines food security as well as energy and water. In September, GCP published a policy brief suggesting policymakers of the Amazon follow the integrated approaches of the water-energy-food nexus so as to promote policies that preserve forests and the service they provide. The international climate talks in Marrakesh, Morocco helped close out the year with the private sector expected to play an important role in the talks. Last year’s Paris Climate Agreement enshrined forests as a key climate mitigation tool, and cleansing deforestation from corporate supply chains is integral to saving forests. The talks were somewhat overshadowed by the surprising results of the United States presidential election on November 8. Donald Trump was elected president raising questions as to the US’ role in future international climate negotiations and action at home. Regional governments, businesses and investors pledged almost immediately after the election that they would carry on efforts to decarbonize and align with the objectives of the Paris Agreement. Indeed, 365 US businesses and investors reaffirmed their support for the Paris Climate Agreement via a letter addressed to US President Barack Obama, President-Elect Donald Trump, Congress and other global leaders and calling on them to continue their support for the Paris Agreement and for low-carbon development. Talking nearly one week after the election of Trump, pension fund managers like Pete Grannis of New York state and Gerald Cartigny of Dutch fund manager MN said they have no plans to re-load their portfolios with high-carbon fossil fuels – because the numbers don’t make sense. The supply change space experienced a wide range of ups and downs in 2016. It closed out the year with two reports, one CDP published and the other from the GCP. CDP’s report, written at the behest of 365 institutional investors, revealed that disruptions in supplies of forest risk commodities could cost USD 906 billion per year. GCP’s report delivered pressing news as well. Of the entities listed on its Forest 500, which names and shames the 500 entities that can end deforestation, 57% either have no policies to end deforestation in place or none GCP deems credible. While both reports were on the doom and gloom side, it’s possible that greater awareness among companies on the benefits of sustainable sourcing, coupled with investor interest in sustainability, could propel them to act. Something to do in 2017.